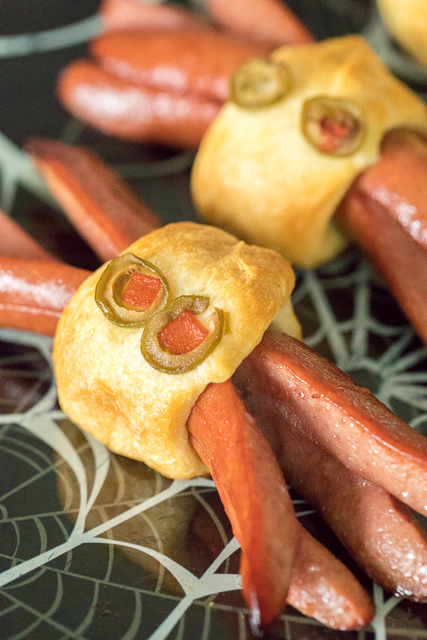 Only 3 ingredients for these festive Halloween hotdogs! Assemble ahead of time and pop in the oven after trick-or-treating. 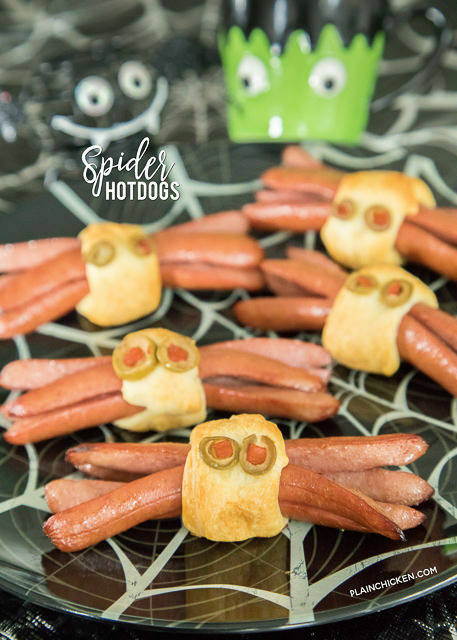 Everyone LOVES these fun spider hotdogs! Perfect halloween party recipe!! 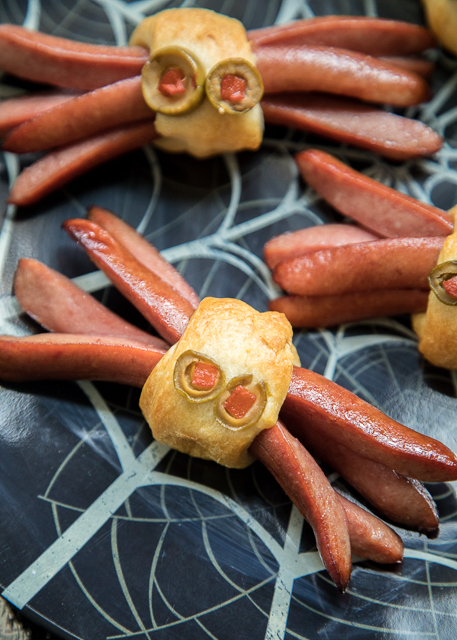 How cute are these Spider Hotdogs?!?! The are definitely the only spiders that I don't mind getting up close and personal with! 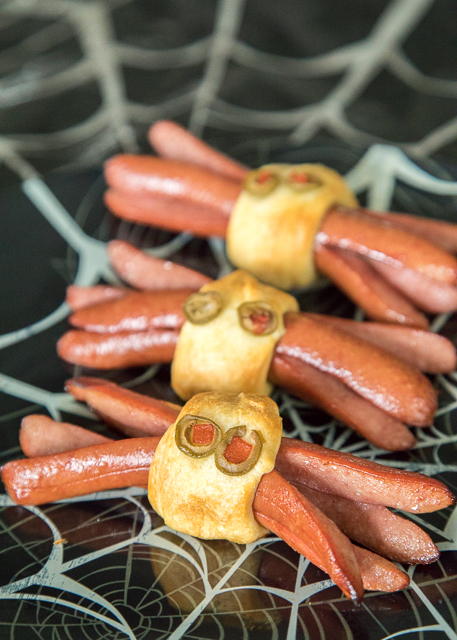 These Spider Hotdogs are perfect for your upcoming Halloween parties! They would be great before or after trick-or-treating. You can assemble these ahead of time and just pop them in the oven when you are ready. I used a package of bun length hot dogs because I wanted to make sure that the spider legs were nice and long. I wrapped the middle of the hot dog with some crescent rolls and topped them with olives with pimentos. I let the hot dogs bake until the legs started curling. Perfectly spooky! Grab a bag of chips, some baked beans or slaw and you have a fun Halloween feast! Cut the ends of each hot dog into quarters leaving about 1-inch in the middle uncut. Open crescent rolls and divide into 4 triangles. Cut eat triangle in half making two triangles from each roll. Wrap one slice of crescent dough in the middle of each cut hotdog. Top dough with 2 slices of green olive and pimento slices, pressing into dough so it sticks. Place on prepared baking sheet. Bake for 20 to 25 minutes, until dough is golden brown and hotdog starts to curl. Super cute! Any suggestion for a sub for the olives? Don't think the kiddos would like that.